Recently, NCSS received an email from James Wellemeyer, now a senior at The Lawrenceville School, a private school in Lawrenceville, New Jersey. The school offers a stipend, the Welles Grant, to students wishing to pursue a summer project. James won the grant to write a civics e-textbook, focusing on youth involvement in politics. TSSP decided to interview this enterprising young scholar about his interesting project. Q: Congratulations on winning the grant and creating an interesting online resource, free for students and teachers. Tell us about what you’ve created. A: My textbook, Young Voices, aims to provide a civics background to American youth and would be most suitable for students between the ages of 10 and 16. It centers on student narratives to inspire other students and, ultimately, hopes to interest, not bore, its users. Throughout its discussion of essential civics information, the book focuses heavily on student narratives in an effort to better engage readers with the material. 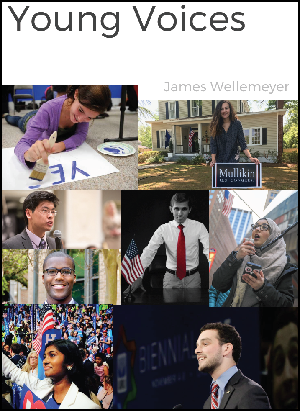 In addition to covering the basic civics, the book also covers the formation of a political identity, the impact of technology on politics, bias in news and reporting, and stories of young people taking political action. Educators interested in reading the book (a free download), and possibly using it as a teaching resource, can request the link by sending an email request to me at youngvoicestextbook@gmail.com. Please include your title and school or institution. Then let me know if you do intend to use the book in some way with your students, as I want the book to reach as many students as possible, as well as to keep track of who uses the book and how it’s used. Q: What inspired you to create a civics e-textbook? Why civics as your topic? Why this Internet medium? A: I saw low rates of youth voting around the country and a general lack of interest in politics among youth. I know this needed to change. No matter our age, our government affects us every single day, and it is important that youth not only understand this, but also give their input as to how our government should be run. Thus, I created the civics e-textbook to ensure the next generation of youth have practical information about voting and are inspired to vote and take political action. Q: How long did you work on this project? How did you discover all the interesting examples of student action and agency all across the nation? Finally, how did you locate and reach the many students who you interviewed to provide the quotes in this 150-page e-textbook? A: I began working on the e-textbook in June 2017 and posted the final version toward the end of August. I interviewed almost 60 teenagers from across the country who are involved in politics and detailed their experiences and perspectives in the book. I conducted interviews through FaceTime, Skype, and phone (no emails), and there were a few in-person interviews for people who live close by. I ask each student about their civics activities, their advice to the next generation of youth, their opinions on a variety of political topics, and what inspired them to take action. I mostly used word-of-mouth and Facebook to get in contact with these young people. Q: Did anything surprise you as you got deeper into the project? Anything unexpected? A: I was certainly not surprised by the level of expertise many youths seemed to have in politics, but I was intrigued. One person I interviewed voiced the opinion that Seventeenth Amendment should be repealed and that state legislators should elect Senators. While I did not agree with this opinion, I found the amount of thought this student had devoted to the topic inspiring. Q: Did you have an advisor on this project? A: Though I received a stipend to conduct the project from my school, I did not have an advisor. The project was entirely self-guided, but I do want to thank my parents for helping proofread the final version and my honors U.S. history teacher, Mr. Rusty Hlavacek, for inspiring me to take a deeper interest in politics. Q: What are your hopes for Young Voices, now that it’s created? Who do you hope might use it, and how would you like it to be used? A: I am currently contacting schools, asking if they would like to use the book, and many schools have contacted me. So far, ten schools have decided to use the textbook in some way, and I am hoping many more will follow suit. A course that employs this textbook should be, at its core, a discussion-based course. Tests and examinations are important for assessing students’ knowledge of government structure and voting procedure, but the ideas of this course extend far beyond those two concepts. Discussion questions (such as “What would you change about the structure of American government, if anything?” and “Is it important for youth to vote? Why or why not?”) frequently appear in the textbook, and teachers should gather the class to discuss these questions in detail.